Many of the papers, including the Mail, Express, Times, Mirror and FT report on what’s described as a "wave" violent crime gripping Britain. The Mail reports that “thugs are running loose on mopeds and motorbikes” and that figures released yesterday show the thieves are striking more than 60 times every day. The FT carries a report saying that the Met Police are turning to technology to tackle moped crime, with officers being armed with tablets so they can track crime hotspots. It says they’ve also been given DNA spray bottles, which can be used to tag suspects with a liquid that allows later identification. The FT and Telegraph also report on comments from the Police Federation, which has warned that police are afraid of pursuing muggers on mopeds because their careers and lives could be ruined if a chase ends with a criminal being injured. “Reports of crimes involving motorcycles, mopeds and scooters are clearly a concern. That is why the Government has worked with the police, industry and other partners to develop a comprehensive action plan focusing on what more can be done to prevent offending and keep the public safe. The Today Programme and the Guardian reported on the start of a High Court legal challenge to the Government's Right to Rent policy, which requires landlords in England to carry out checks on the immigration status of prospective tenants. Today interviewed Satbir Singh from the Joint Council for the Welfare of Immigrants, who said that research found that 42% of landlords are less likely to rent to someone without a British passport. 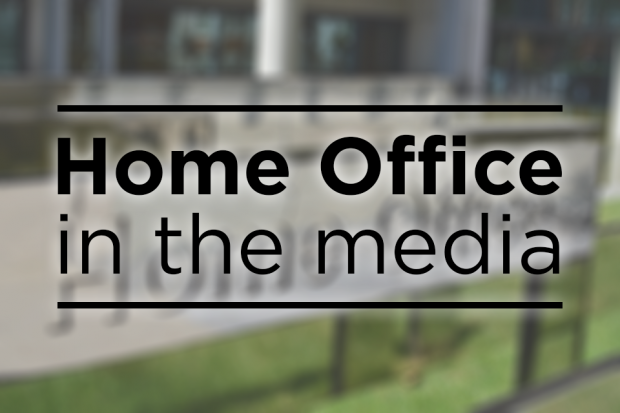 Today reported that the Right to Rent scheme was seen as a key part of the Government's strategy to create a compliant environment for illegal immigrants, and that penalties range from a fine to five years' imprisonment.